Chicken skin is terrible for us - but unlike beef, which is marbled with fat, the fat on chicken lies just below the skin. We strip it away and breed our chickens to be less and less fatty. Let’s talk about the kind of fat you’ll find in chicken skin. It’s mainly monounsaturated, in the form of oleic acid. Oleic acid, also found in olive oil, is known for beneficial effects on cholesterol. Of course there are also saturated fats in chicken skin. This is no accident. Nature provides what the body needs. The body does not need soda. The body does not need cotton candy. Or Gatorade. The body does, in fact, need some saturated fat. So eat it. If you’re in the calorie-counting camp, there’s roughly a 50 calorie difference between chicken with or without skin. Seems a small price to pay for a huge increase in flavor and satisfaction. Did I mention flavor and satisfaction? When your food satisfies your taste buds and body’s cravings, you don’t need to eat as much or as often. Sugar cravings subside and you can go back to loving food instead of fearing it. That’s huge, people. Fat doesn’t make you fat. If it did, the lowfat/nonfat craze would have given us a country of slender people. Instead, we have an obesity epidemic. It just doesn’t add up. Here’s a thought. 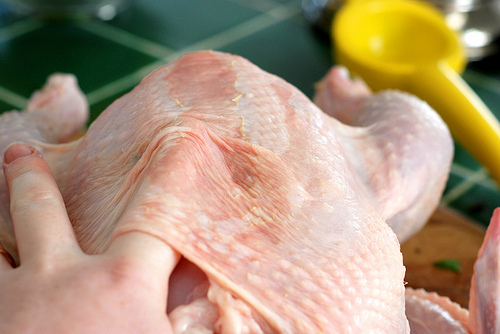 Eat the skin that occurs naturally on chicken. Don’t eat I Can’t Believe It’s Not Butter, Power Bars, Eggo Waffles or other foodstuffs made in lab. See what happens.